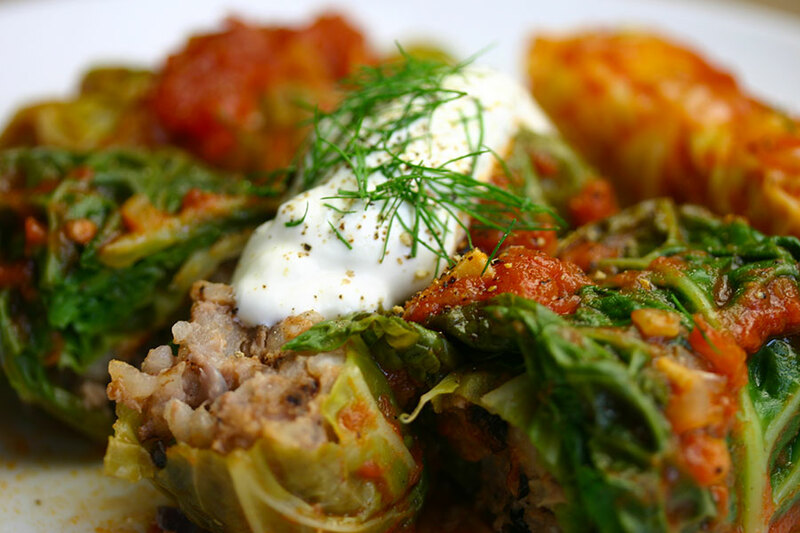 Cabbage rolls are the most Ukrainian of dishes, but they are also very Canadian. After all, Canada is home to more than 1.2 million Ukrainian-Canadians, – the world’s third largest Ukrainian population (after the Ukraine itself and Russia). 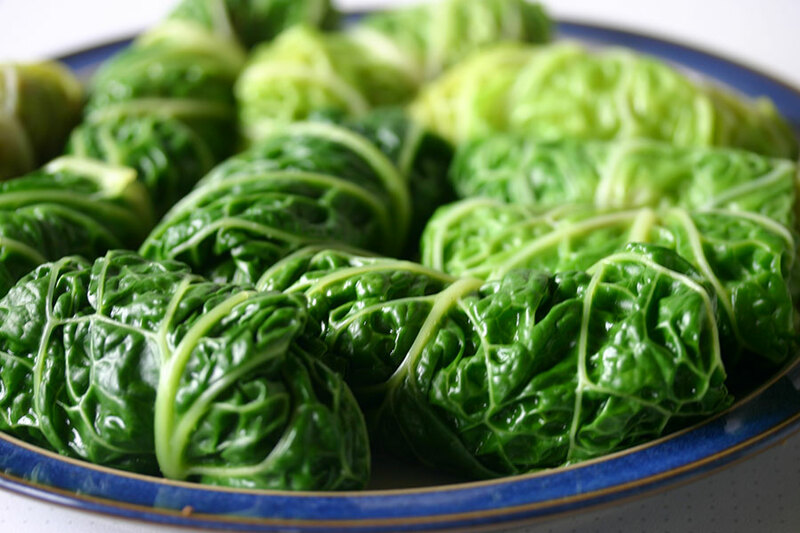 After looking at a number of recipes online, I didn’t follow any one in particular, but tried to address the things that have left me less than enthusiastic about cabbage rolls, which I’ve often found to be watery, tough-yet-overcooked, heavy and bland. I tried both Savoy and the usual white cabbage, thinking that the Savoy cabbage result in a lighter, softer roll. I omitted the tinned tomato soup that features in many recipes, and made a tasty tomato sauce I’d actually want to eat. I went for a 50/50 mix of ground beef and pork, and having used Japanese rice, decided against adding egg to the filling. I also made somewhat smaller, thinking they might be less dense. I also followed Olia Hercules’ suggestion of adding barberries to the filling. Start by making the sauce. Heat the oil in a frying pan over medium heat. Add the onion and sauté until softened. Add the garlic, and cook a few minutes more. Stir in the tomato paste and cook for another minute. Add the tomatoes (breaking them up if they are whole), sugar, and a tin full of water. Simmer for fifteen minutes, or until the sauce has thickened. Season to taste and set aside. Bring a large pot of water to the boil. Core the cabbage, and carefully separate the cabbage leaves from the head. Blanch the leaves for two or three minutes to soften them. Drain and spread on paper towel to dry. Parboil the rice for 5 minutes, then drain. In a large bowl, combine the rice, beef, pork, onion and barberries (if using). Season generously with salt and pepper. Trim the ridges from the outside of each leaf so that they are uniform in thickness. Place a generous dollop of the filling at the bottom of each leaf. Roll until it is covered, then tuck in the sides and roll the rest of leaf to make a neat parcel. Preheat the oven to 350°F (175°C). Spread half the sauce in the bottom of a large casserole dish. Arrange the cabbage rolls on top – they should fit snugly. Spread the remaining sauce over the top. Cover tightly with tinfoil and bake for an hour and a half, until the filling is cooked through and the cabbage tender. Serve topped with sour cream and fresh dill, if desired. I love your blog Andrea! I was very pleasantly surprised. They were tasty comfort food. The barberries were an inspired suggestion, and I liked the way the sour cream worked with the tomato sauce. Yay she likes them !!! Your cabbage rolls look amazing. Some people add raisins, but no one does in my family, so I don’t add either. Yeah, I had to google what are the barberries like..
Browning them is an interesting idea… I think a good tomato sauce is really important. They release a lot of water when they cook, so the sauce will get thinner.